The first lady "supports family reunification" and wanted to meet separated children for herself, a spokesperson said. 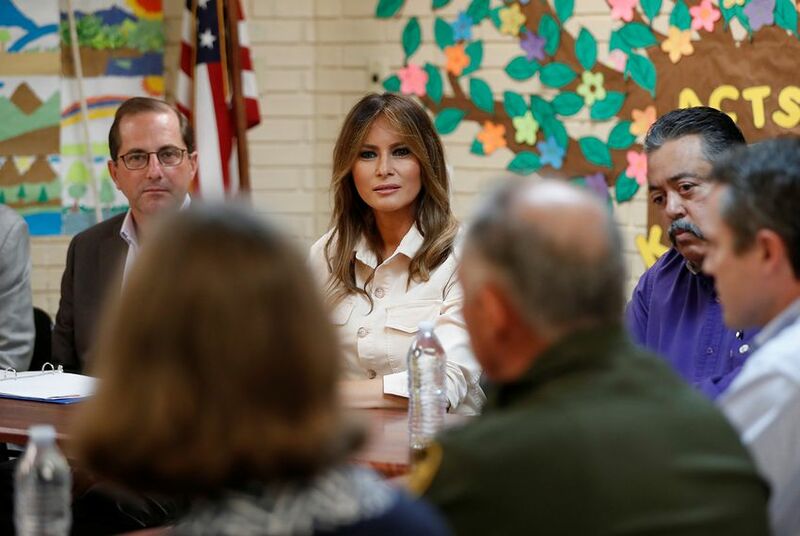 First lady Melania Trump made an unannounced trip to the border on Thursday, visiting a children's shelter in McAllen. The message, “Acts of kindness make me bloom,” was printed in bright yellow letters on the wall behind Trump. When asked how often the children get to speak with their parents or family, program director Rogelio de la Cerda Jr. told Trump they get a 10-minute phone call twice a week. At the shelter, Trump visited three classrooms, shaking hands and asking the children questions about themselves, according to the pool report. One child told her she’d been there for two months. “Be kind and nice to each other, OK?” Trump told the children. In one classroom, “Welcome! First Lady” was written on a white board draped with a hand-painted U.S. flag. A child in the classroom told Trump they had been learning how to celebrate the Fourth of July. The first lady also planned to tour the Ursula Border Patrol Processing Center, but the visit was canceled because of flooding at the center. Disclosure: Upbring has been a financial supporter of The Texas Tribune, a nonprofit, nonpartisan news organization that is funded in part by donations from members, foundations and corporate sponsors. Financial supporters play no role in the Tribune's journalism. Find a complete list of them here.